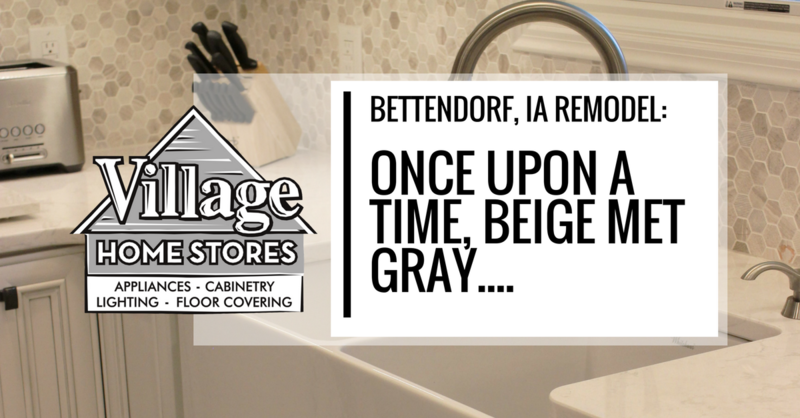 A Classic tale of Gray meets Beige… Ok fine this might not seem like a classic tale but trust us, warm gray tones are everywhere in the home finishes industries. Say goodbye to Beige everywhere and say hello to the new neutral: Gray. Not always bland and cold as stone, Gray tones can be warm and inviting. Someplace between Gray and Beige is… “Greige“! 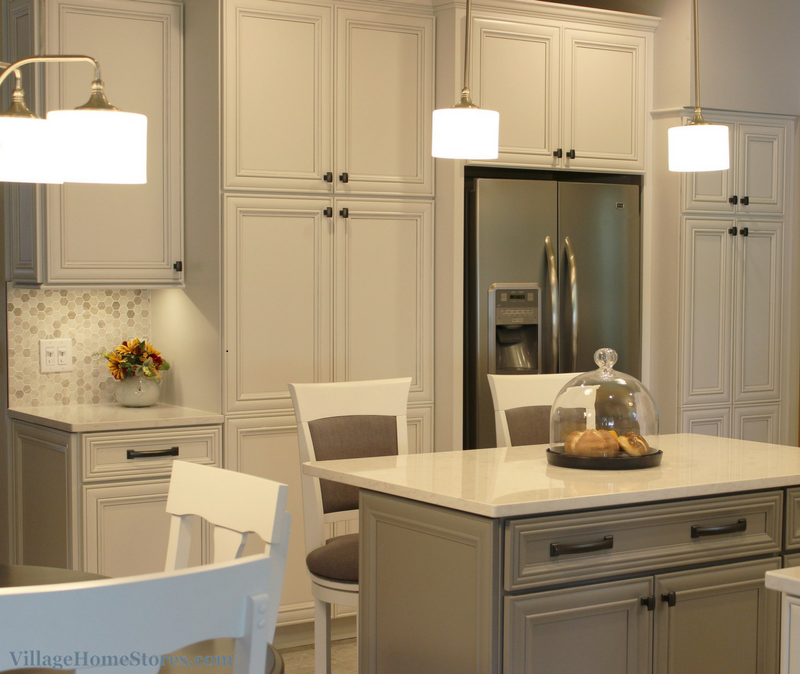 This Bettendorf, IA kitchen showcases the perfect palette for this neutral color concept. The original kitchen in this home was a medium stained Oak cabinet with neutral toned countertops. Once ready for an update and a brighter look, this Bettendorf home is now a magazine-cover worthy space. Take a look at the transformation. 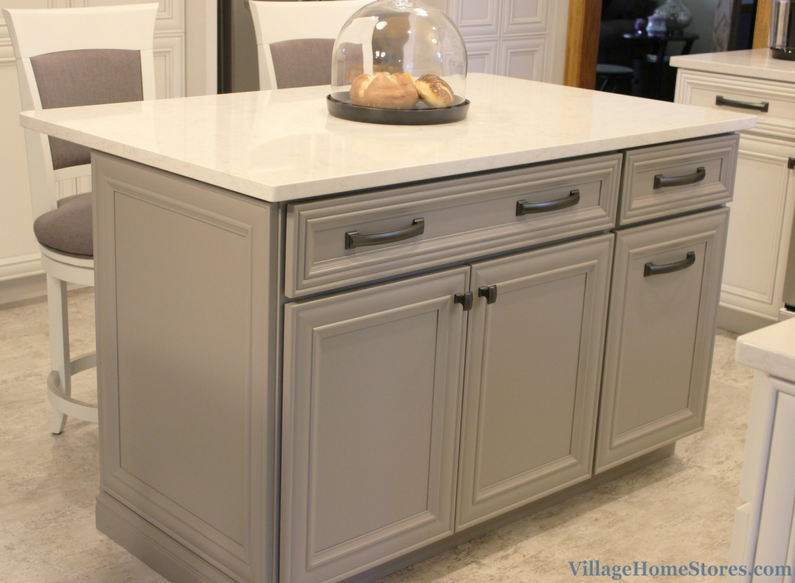 Painted white cabinetry from our Koch Classic line has been given a “Smoke” highlight accent and a wood hood and kitchen island is painted in the “Fog” finish. The “Legacy” doorstyle is a fantastic choice that provides many edges and details that the “Smoke” highlight can catch up on. 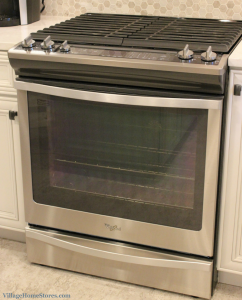 A decorative wood hood in the accent color is fit with a Broan hood insert within it. That same “Fog” painted finish from the hood is found on the kitchen island that includes an overhang and seating for two at counter-height. While you may think next to the kitchen sink is the best location for your pull-out waste basket cabinet, an island can be a better choice. Include this cabinet within reach of the sink user but easy to access for guests when entertaining. A waste basket cabinet in the island can be easy to find and keep the sink area from getting too crowded. We have to admit that sometimes one element of a complete design stands out as the “MVP”. 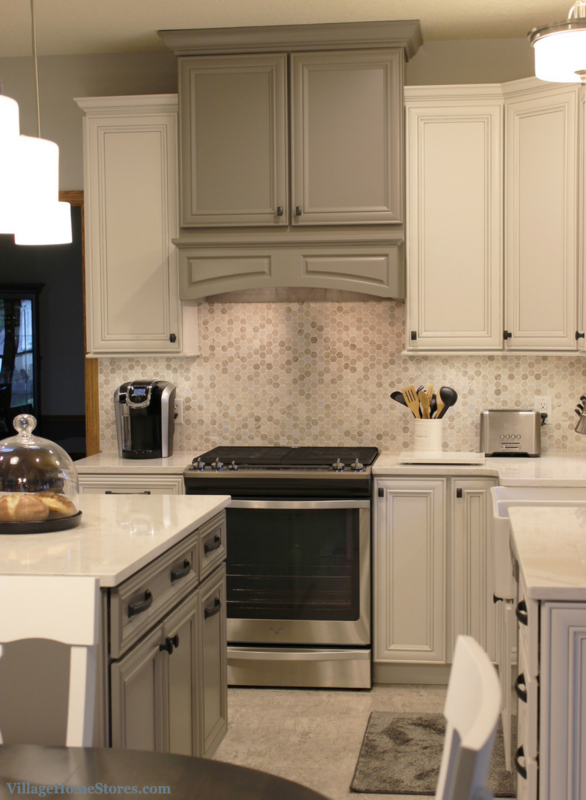 In this kitchen it is absolutely the tile backsplash! This geometric mosaic tile by Glazzio is from the “Excalibur Series” in the “Winter Fjord” color. It perfectly blends both cabinet finishes, the countertop selection, and the flooring together. Our Diode L.E.D. undercabinet lighting system showcases this tile perfectly and the look is amazing day or night. 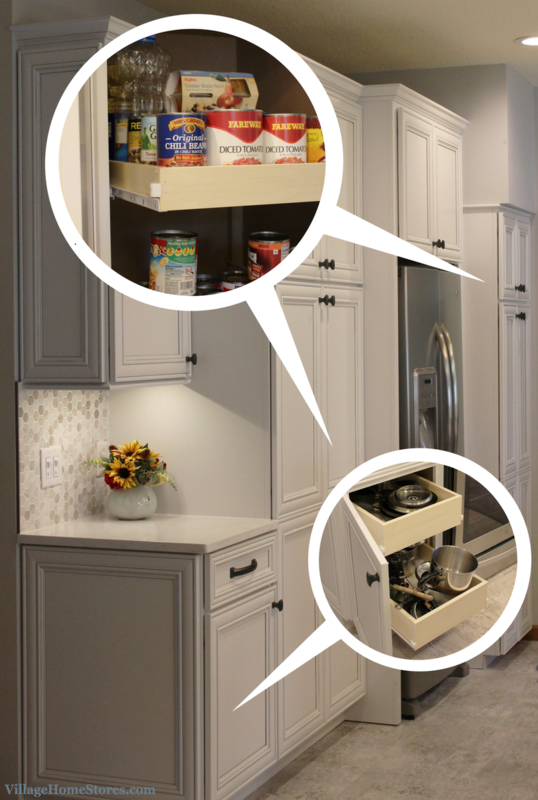 Plenty of pantry storage plus two slide-out bins in the end base cabinet. Also note the exposed ends of the cabinetry in this kitchen. 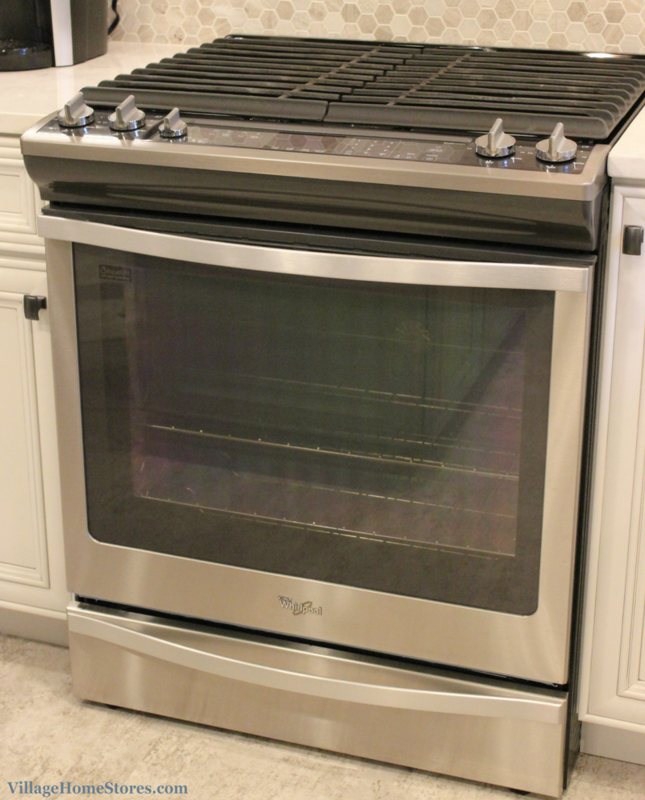 In place of a smooth, painted finished end matching cabinet doors have been applied for a gorgeous finished look. Including “Applied Door Ends” is an exceptionally nice detail in a kitchen with a mitered and glazed doorstyle like this. Not to go un-noticed is a gorgeous farmhouse sink in this kitchen. A design selection that is a statement all in itself, this Whitehaus smooth-front apron sink is an instantly classic look. 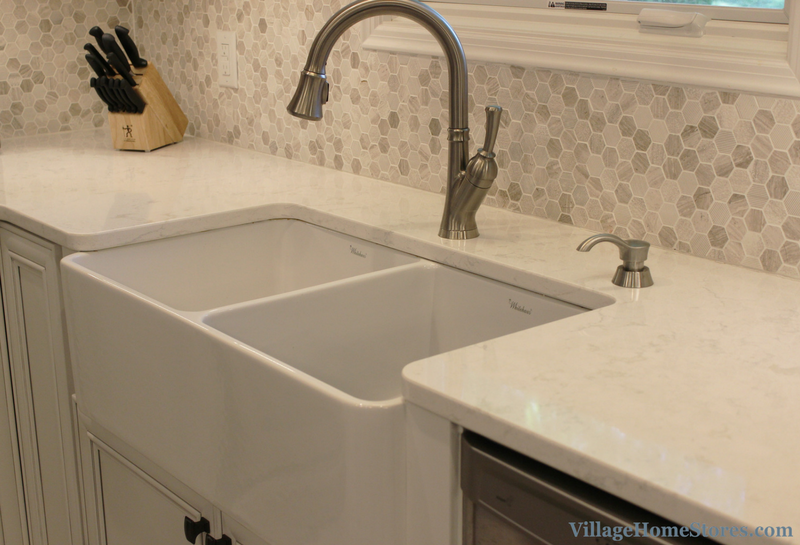 The farm sink has been undermounted to Cambria’s “Torquay” quartz counters in the standard “Eased” edge profile. This Cambria design adds a perfectly polished and upscale look without overpowering the backsplash tile with too much pattern. This entire design is about balance. Balancing accent colors, pattern, texture, even hardware sizes. Having a designer with you during every decision for your project helps you get the end result you have been dreaming of. All of these selections sit on top of a luxury vinyl tile by Armstrong. 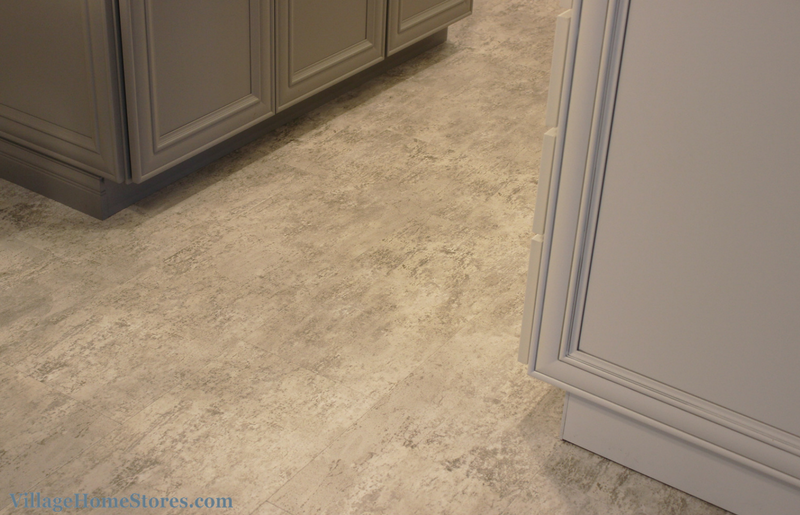 This 12″ x 24″ LVT is from the “Alterna” series in the “Silver Shimmer” color. 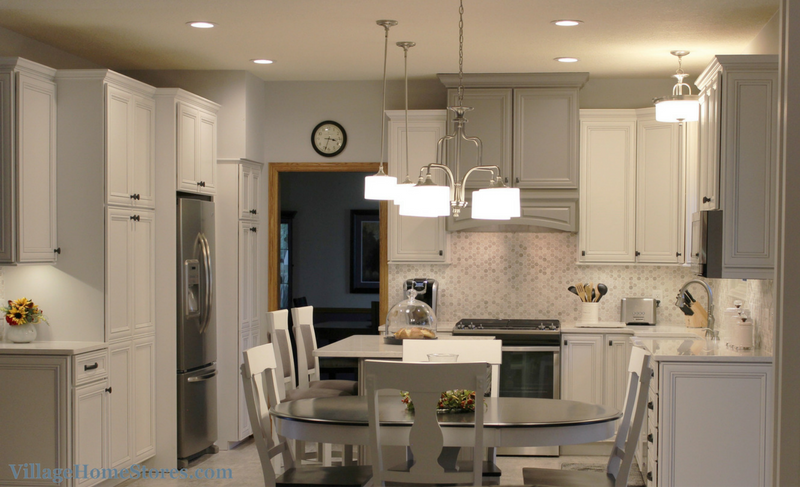 Love the look of this kitchen and want to see more? 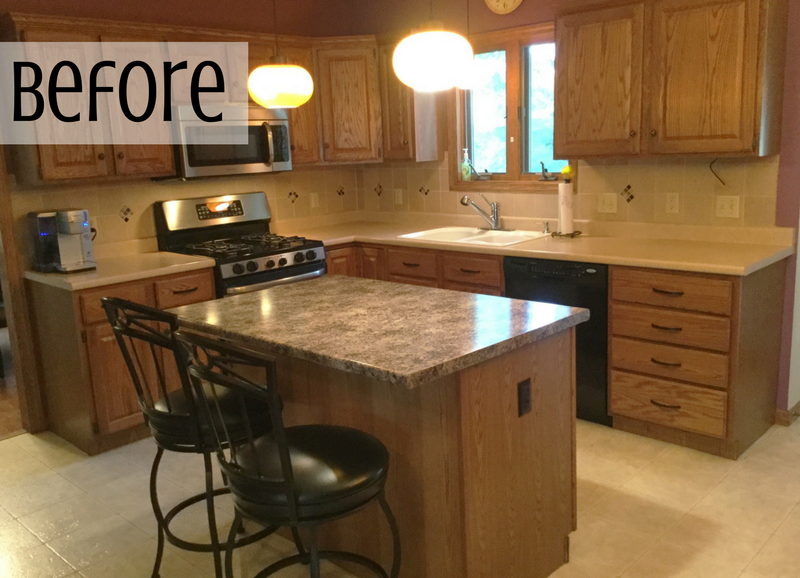 See the entire album of photos from this Bettendorf Remodel over here on our Houzz portfolio. Also be sure to check out our “Gray is Here to Stay” board over on Pinterest to see more beautiful Gray and neutral spaces. When you are ready to start the conversation about your own kitchen project we are ready to set that appointment for you. 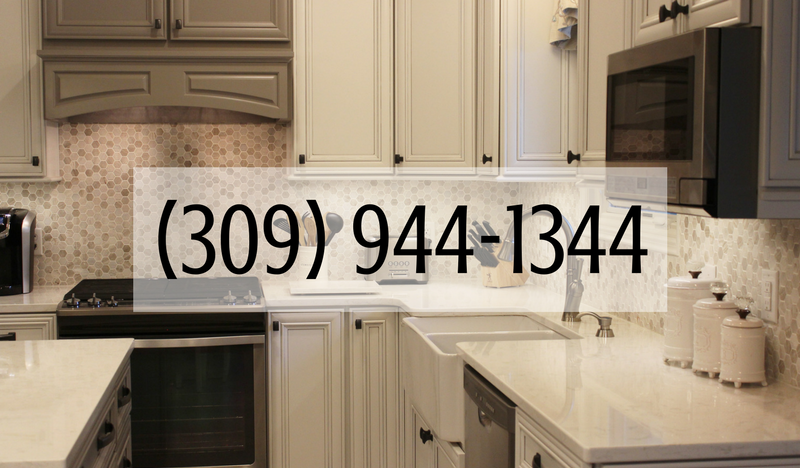 Contact us via phone at (309) 944-1344 or by completing this short contact form on our website.